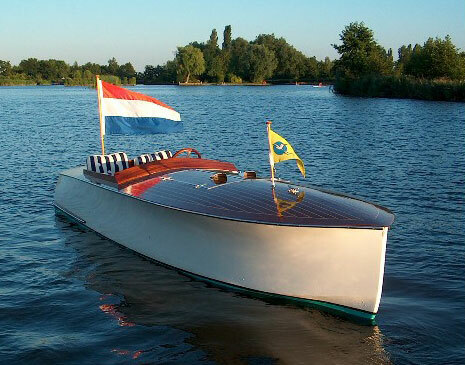 In July 2003, Rob Douwes launched his 17'6" Gentlemen's Runabout KNOCKABOUT on Lake Westeinder, Aalsmeer, in the Netherlands. The plans (#76 from WB), by Hacker and Zimmer, call for a 16' hull, but Rob extended the boat's length by spreading the frames apart just a little bit. Rob took 800 hours to build the boat in the garage of his house. KNOCKABOUT'S hull has a wood core of red cedar covered with glass and epoxy. 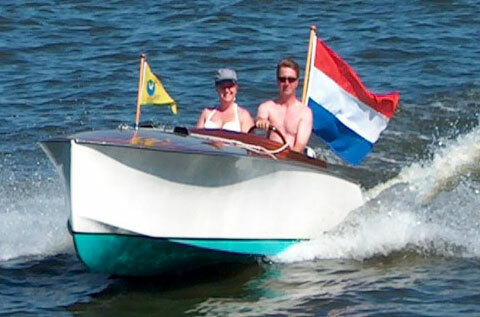 A Renault four-cylinder 40 hp car engine pushes the boat through the water. Reach Rob at rudder@planet.nl.